Our veterinary clinic believes cats deserve a room of their own… No dogs allowed! 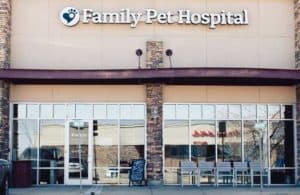 Family Pet Hospital provides a uniquely effective environment for our clients and our feline friends. A visit to the veterinarian can be especially scary for cats, resulting in fear-associated aggression, which can be dangerous for them and the people nearby. The ability to conduct a physical examination also can be compromised. Therefore, it is important to approach cats in a way that is not threatening to them, and provide them with a place where they feel safe. Our methods decrease fear, stress, and anxiety for our feline friends. The process starts by utilizing a cats only exam room. No dogs are allowed in this exam room so that there are no odors that cats might find stressful. Our feline friendly exam room also has many different options for cats to stay busy, entertained, or in a comfortable spot. This helps them feel at home and distracts them from the medical part of the visit. We use other fear free methods too. For example, a pheromone–Feliway–that has been shown to help calm and ease cats is incorporated into feline exams. Of course, we also provide a wide variety of snacking options (hard treats, cheese, etc…) to provide another layer of distraction from the exam. During exams, we use “Fear Free” restraint, meaning we utilize the minimal amount of restraint needed to reduce the stress on the patient. In this case, less is more. The result is more efficient veterinary care and safer conditions for the patient, client, and veterinary team. Conducting feline exams this way has several excellent benefits. Beyond the obvious decrease in fear, stress, and anxiety, we also tend to see that a more trusting relationship is built between the client, patient, and veterinary staff. This patient/veterinarian trust is essential for building a bond, which is conducive to stress-free lifelong medical care. Likewise, the emphasis on creating a feline friendly environment creates a confidence within pet owners that tends to result in better client compliance when at-home care is needed.